A European survey conducted by the Construction Industry Training Board (CITB NI), as part of a Belfast Met-led EU Horizon 2020 BIM (Building Information Modelling) programme known as BIMcert, has shown that two thirds of construction companies are planning to implement BIM within the next 3 years, highlighting the increasing need for companies to adopt and invest in BIM technology and processes. Findings also showed that the full value of BIM is underestimated, with an appreciation of the short-term benefits of BIM shown by the majority of respondents, and an undervaluing of the long-term benefits to sustainability and near zero carbon buildings and the associated cost savings. The BIMcert project led by Belfast Met, which brings together 7 European academic and consulting institutions from across Europe, including CITB NI and the Dublin Institute of Technology (DIT), aims to provide a comprehensive BIM training and qualification scheme for all levels of the construction supply chain. With the priority on developing an industry-led qualification scheme, CITB’s role has been to engage with the construction sector through a comprehensive survey and series of workshops, so as to determine the awareness levels of BIM and the perceptions around BIM, to enable the development of an appropriate upskilling framework. The aim is also to attempt to quantify the impact of upskilling, in terms of the value of projects that could benefit from the efficiencies of implementing BIM. 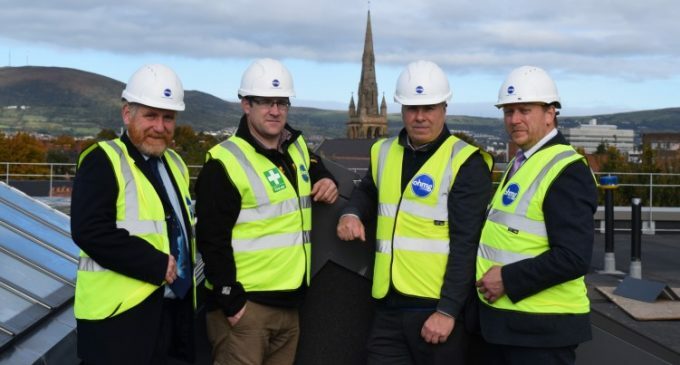 Pictured from left: Paul McCormack, Belfast Met; Niall Doyle and Eamonn McDonnell, O’Hare McGovern Ltd; with Barry Neilson, CITB NI, at Queen’s University Belfast’s new School of Biological Sciences, one of Northern Ireland’s largest BIM Level 2 projects, which is currently being completed by O’Hare McGovern.